Kudlow's Money Politic$: Deja Vu? "I'm not sure that an anti-war Democrat can win [the general election]. We haven't proved that yet. Some people point to the fact that the war in Vietnam was dreadfully unpopular, but that when I came out for an immediate withdrawal, it helped me win the nomination but not the general election. And there may be some truth about that." 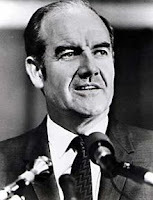 -George McGovern, former Democratic presidential nominee who lost the 1972 election in a landslide winning only 38 percent of the popular vote. Click here for my thoughts on why the Dems are dooming themselves to defeat in next year's election.